» The thought has crossed my mind about a body kit. » Rise from the dead??? Injen CAI, JWT stage 3 clutch and flywheel, Veilside III body kit, Seibon hood, 19" Axis rims, Sparco racing seats with Sparco 4 point racing harness, Kicker speakers everywhere (doors, headrests, subs, tweeters), 1000 watt digital Kicker amp and other little look good stuff. I guess I'll start this so we can get this right name is Jesse President of Street Mod Performance. I drive a red 1987 Nissan 300Z Turbo'd. Just bought the car in March all stock. Hello im Chan. my first names really jonathan but i like my last name better. 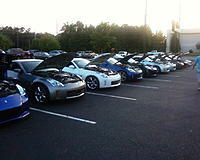 i drive a daytona blue 2006 nissan 350z. Wuz up my name is Javin I have a 08 350z HR i haven't done much to my car but I will soon. I've started my trip home. Lets just say i have a part or two waiting for me, I'm sure Jesse will be glad when they are out of his garage. Hi my name is Todd I drive a White 300zx with a twin turbo swap.